Seti Afoa of Samoa Events announced the nominees for the Samoa Events Athletes of the Year. Voting will open next week using a Monkey Survey link. 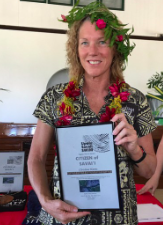 Christina Harris, a 54-year-old from Nelson, New Zealand, is one of the nominees for the Athlete of the Year who will receive a return flight between Samoa and Auckland or Sydney, five nights accommodation for two individuals at the Taumeasina Island Resort, and five days care rental. In April, Harris won the 22.3 km Apolima Strait Swim from Upolu to Savai'i in 6 hours 53 minutes 11 seconds. She returned in July to win the Pacific Open Water Challenge for the fourth time. She also finished second female in the very competitive Samoa Swim Series. Harris is a multiple winner since her first trip to compete in Samoa in 2013.